We've created this new template to help marketers plan a campaign if they are managing it themeselves in a small business or are briefing colleagues and agencies in a larger business. Agencies may find it useful for reviewing their campaign processes. We also hope it will help prompt you to think of different ways of integrating new digital marketing approaches into your campaigns. Campaign goals and tracking. What are we trying to achieve through our campaign and how will we know when we achieve it? Target audience, customer insight and targeting. Who are we trying to reach and influence? Key campaign messages and offers. How are we trying to position our company, products and services? 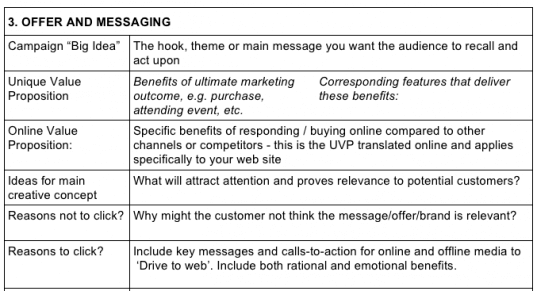 Which campaign or product offers will engage and convert our audience? Strategy or strategies. How will you reach and engage your target audience. Online media mix selection and budgeting. Which media do we think will be effective? Typically an agency will recommend this, but clients will have suggestions based on past campaign performance. Media schedule and campaign integration. 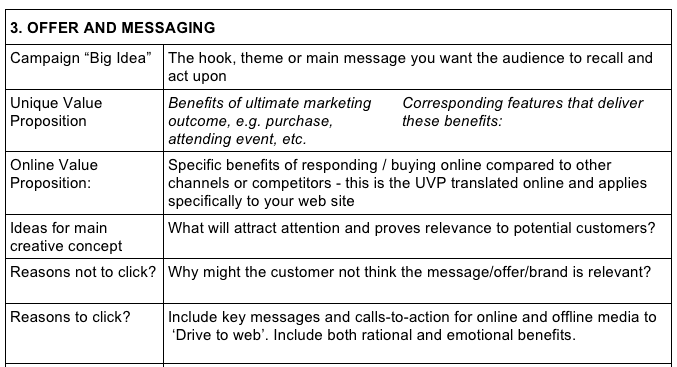 What is the sequence of deploying media and what are the waves of message/offer during the campaign?